YTView is a mediocre social media marketing company that provides promotional services for some of the most popular social platforms. Everything about this provider can hardly even be considered average, from their lack of customer protection policies to their poorly-constructed website. Their Facebook likes prices are also not the most affordable, with their cheapest offer being $50 for 1,000 likes. They have vast options for their Facebook services, including Facebook likes, followers, comments, status/photos/video likes, post likes, and fan page likes. Their customer support is not impressive as well, providing only email support. 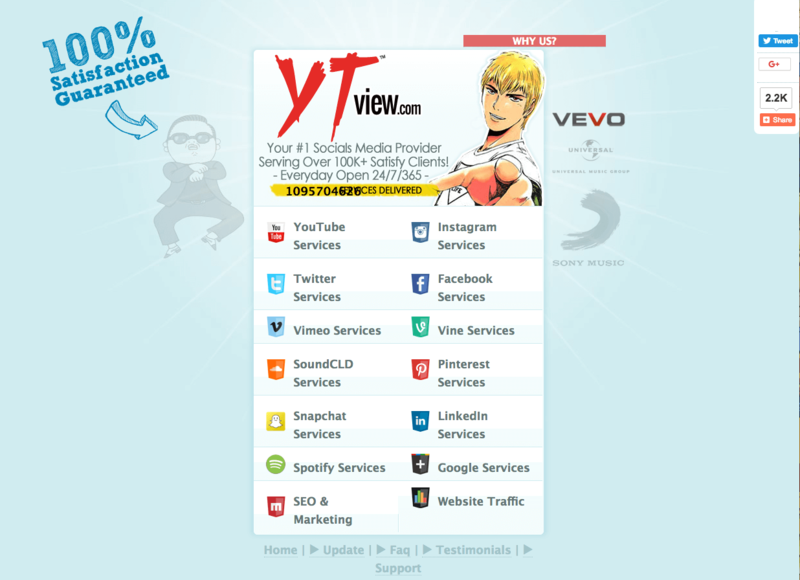 YTView is a social media marketing company that was established in 2012. The company claims to deliver quality social signals that originate from real people. According to their website, they have served over 100,000 customers to date. They offer 10 Facebook page likes plans that are quite expensive. The company claims that they will never share or sell confidential information to third parties. They offer a 100% money-back guarantee if they fail to deliver an order to you. Payments can be made through PayPal and credit/debit cards. YTView supposedly uses safe methods of delivering the likes that won’t get your account banned or restricted. 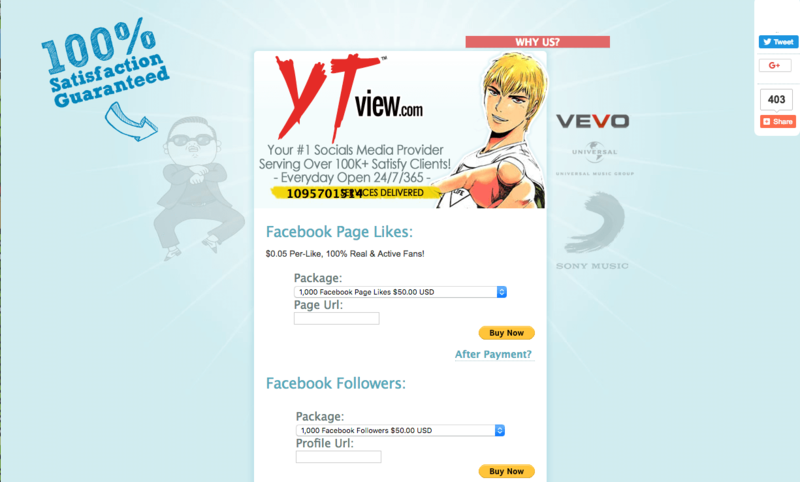 YTView offers extensive Facebook services that include page likes, posts likes, comments, video views, and followers. The delivery time of their services is standard for all orders. According to their website, you should expect to see an increase in your profile within 1-3 business days, and it would take a minimum of 3-7 days for the order to be delivered. All of their services are protected by a 100% money-back guarantee. We reviewed the terms and conditions sections on the YTView website and made a few comments on their status below. To find out more details on these, then please toggle the sections to see what we thought! The company doesn’t have a Terms and Conditions section on their website, but we found an FAQ section where we managed to dig up some information. The company claims that all the likes come from real people from all around the world. They guarantee that their services are completely safe, and you won’t get banned by using their services. 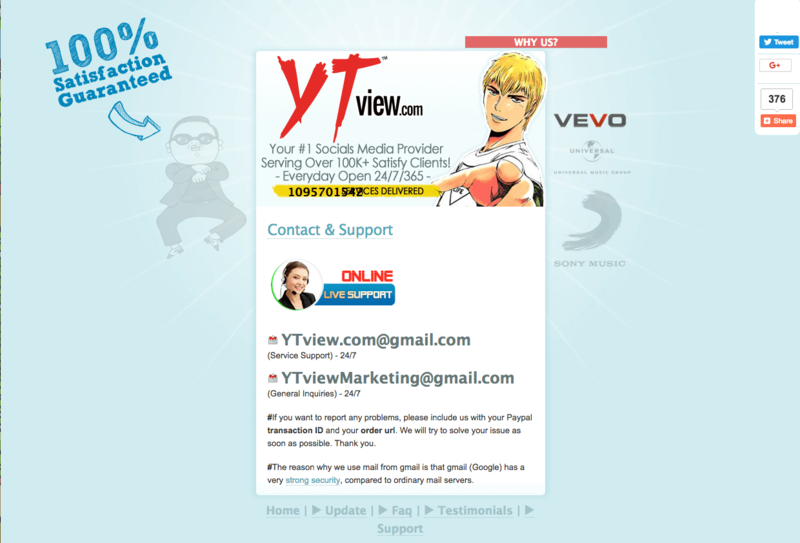 According to their website, YTView offers a 100% money-back guarantee only if they can’t deliver the order to you. There are no additional instructions to help you understand how you can become eligible for a refund request. There is no information regarding the retention policy of this provider on their website. This is yet another field in which YTView did not impress. We’ve tested this provider twice, and we didn’t receive any response whatsoever both times. The only way you can reach their customer support team is through their email support. They have two emails listed on their website, one for general inquiries YTViewMarketing@gmail.com, and another for service assistance YTView.com@gmail.com. Their unresponsiveness can be a potential issue for customers that have concerns with their orders. Since we didn’t receive a response from their customer support team, we weren’t able to send them our questions regarding their services. We will update this section if they ever respond to our inquiry. There is nothing persuasive about YTView’s packages that would convince us to recommend their services to you. They have ten Facebook page likes plans, but they are above the industry average price and they also lack a retention guarantee. The provider does nothing to describe the quality of the likes other than stating that they come from real people. We don’t know if they have real profiles, profile pictures, full bios, followers, or posts of their own. According to their website, the likes should start arriving within 1-3 days, and the delivery should be completed within a minimum of 3-7 days. The delivery time is standard for all orders and doesn’t change depending on the number of likes delivered. That sounds a bit unreal, because, in our experience, it can’t take the same amount of time to deliver 1,000 likes and 100,000 likes. Again, the provider does very little to describe the quality of their services. They say that their likes originate from real people and are delivered in an organic manner, but they fail to go into more detail regarding the delivery process and the type of likes they deliver. We don’t know if the users have real profile pictures, full bios, posts on their feed, or followers of their own. The provider doesn’t give any information concerning the retention rate of their likes. We don’t know if they refill in case some of the users unlike the post/page, we don’t know for how long the likes are guaranteed to stay, or whether they will engage with the clients in any other way. Nothing about this provider leads us to believe that they actually provide quality services. They have an outdated website style, no customer protection policies, no retention rate, and poor customer support. They lack most of the things that are needed to label a provider as a top-quality solution. Other than their refund policy, they do very little to describe how they deliver the orders or whether your personal information will be safe with them. We tried to reach YTView’s customer support team on two separate occasions, and both times we didn’t receive any feedback. We can’t recommend YTViews as a good solution for your Facebook marketing needs. If you want to collaborate with a company that is established, has a positive reputation, and will help you boost the organic growth of your Facebook account, please read our list of top Facebook likes providers. My order for 10K Facebook page likes was completed in under a week. I had been skeptical, but I now got faith in their word.